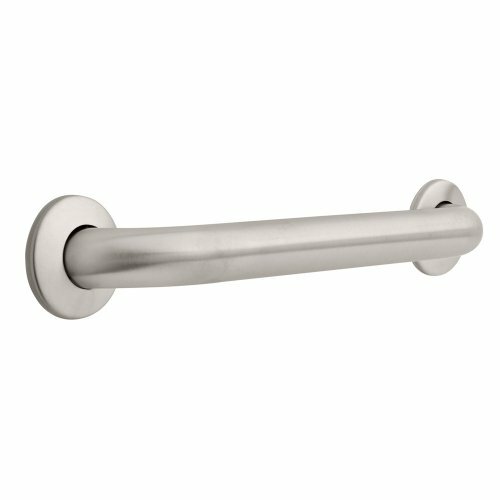 The Franklin Brass 16” Concealed Mount Grab Bar provides leverage, support and stability for up to 500 pounds, exceeding ADA standards, while adding a decorative touch to your bathroom. With only 2-3 screws required for a secure mount, the five screw flange gives you installation flexibility to accommodate your individual grab bar mounting needs. The decorative flange cover fits securely over the grab bar flange, concealing the screws. Crafted from stainless steel for lasting quality and durability, and available the metallic, smooth and shiny Stainless Steel finish to coordinate beautifully with most bathroom finishes. Accidents can occur, but be ready before they happen. Make bathroom safety a part of your home décor. We’ve provided a suggested product placement guide and installation videos to get you started. Being safe is easier than you think.